Designed, developed and manufactured by Badger Meter under strict quality standards, the M1000 features sophisticated, processor-based signal conversion with accuracies of ± 0.3 percent. 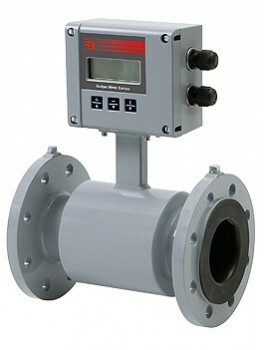 With an accuracy of ±0,5 % of actual flow (> 0,5 m/s) and flow measurements ranging between 0.03 and 12 m/s in both directions, the flow meter covers a great variety of applications. Models range from DN 6 to DN 200 with a range of connections available including DIN flanges, dairy pipe connections, TriClamp®, etc. The unit can be powered by either 24 VDC or 115/230 VAC power supply. The basic unit comes without display while the M1500 includes a 4-line LCD. It is encased into a powder-coated aluminium diecast housing IP 65 and has two M20 screws. The standard model ModMAG® M 1000 is supplied with an analog output, two digital outputs for pulse and frequency as well as a digital input.